So how many youth orchestras does one city need? Whatever you consider the number to be, it seems reasonable to say that more is probably better when it comes to this category. Giving audiences a chance to hear live music while young musicians gain experience and training doesn’t really have a downside. So we were all in luck this weekend when the Young Artists Symphony Orchestra burst into existence at Royce Hall under the leadership of Artistic Director, Alexander Treger. Treger knows plenty about working with young musicians having led the American Youth Symphony as Music Director for 17 seasons in addition to his teaching activities through UCLA. After leaving AYS and retiring after more than 30 years with the Los Angeles Philharmonic, Treger has launched into a new project with 100 young musicians in various stages of training from ages 15 through 26 culled from all over Los Angeles to make up the new YASO. 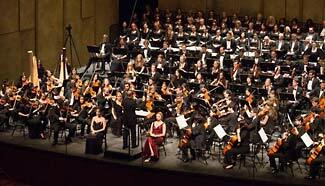 And, what better way for an orchestra to enter into its existence than with Mahler’s Symphony No. 2? There were no half measures for this first performance that featured the soloists, soprano Amanda Achen and mezzo-soprano Niké St. Clair. It was a big night for this ensemble coming together in public for the first time, and Treger’s certain hand cut through the clear nervous excitement among the players. Mahler is about big gestures and the players reveled in making the most demonstrative moments in the score. What lacked in precision was more than accommodated for by sheer excitement and force of will. Best of all here was a big glorious orchestra providing the real deal – live performance of one of the world’s greatest – all for free. What’s not to be excited about? Yes. More please. YASO has their second of four performances on Dec 6 at Royce Hall. It may just be one of the best deals in town.